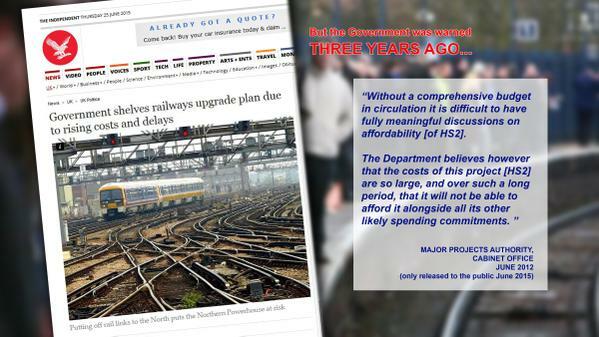 However, given that HS2 has been going now for over five years this assurance seems completely hollow, and the idea that ‘urgent action’ will be actually taken to ensure the project can no longer be credible, given that the HS2 project first received an amber/red rating in November 2011. While announcing cuts to Network Rail projects yesterday, Transport Secretary Patrick McLoughlin said “All of these problems could and should have been foreseen”, a sentiment he seems to be ignoring when it comes to HS2. Besides the overall amber/red rating, no details of the findings from the MPA have been published, with the Government choosing only to publish a response to the MPA findings from the departments responsible for each project, in a spreadsheet attached to the report. Not surprisingly, the response regarding HS2 from the DfT brushes aside the amber/red rating, claiming that ‘excellent progress’ has been made since the project was assessed. Yesterday, The DfT pulled out of a Judicial Review, brought by the Information Commissioner and Dr Paul Thornton, into the decision to veto the publication of MPA reports on HS2 from 2011 and 2012. The DfT cited the ‘Evans Case’ which saw the publication of letters from Prince Charles as creating a precedent which made the use of the veto in this case to be ‘unsustainable’. This has seen renewed calls from calls for campaigners for the more recent reports to also be published in full. Some of the MPA information released three years late.